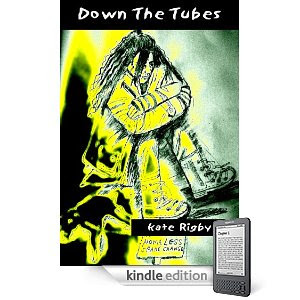 “Down The Tubes” by Kate Rigby Book Review. Down The Tubes is the story of a dysfunctional family driven by lack of communication, addiction and abuse. It’s the late 1980s and mother of four, Cheryl West, lands herself a job at a drugs project in London. But memories of her old life are never far away, especially when her surly daughter, Elaine, makes her unwelcome visits. Meanwhile, Cheryl's estranged son, Michael – aka Dodo - is ironically having his life destroyed by drug addiction in his attempt to avoid painful memories of abuse. He goes from one chaotic situation to another, ending up on the streets and reaching rock bottom, until he is referred to a drug rehabilitation centre in rural Hampshire. The lives of mother and son nearly coincide, as Cheryl uncovers some dark family secrets. They’re each on a journey, but can there be reconciliation as well as rehabilitation? This book is riveting, yet I found it difficult to read. Don’t get me wrong, it is beautifully written. It was the gut wrenching insights into dysfunction that floored me. Written in such a way that in spite of the dirt and pain it was impossible for this reader to stop reading. The characters are so very real, their lives laid bare with a merciless touch, you feel for them deeply, or most of them. I felt sympathy and empathy for Michael aka Dodo: Michael who searches for an unconditional love his entire life and finds that in only exists in the eyes of his own child, and then for only as long as that child remains a child. Michael who wanted and needed love and acceptance from his mother Cheryl, only to be turned away because he disappointed her in some way. Michael who was loved and sexually abused by his father…Michael who ran and kept right on running, drugs addled his mind, and neglect punished his soul. Cheryl who wanted more from life than the children that she bore. Cheryl whose selfishness drove her to a point where she denied being a mother at all. I felt no empathy for Cheryl apart from the acknowledgement that we all at some point question where we are in life, her character is easy to despise, and I found that the feeling that remained with me throughout this work. The author doesn’t spare your emotions on the journey into dysfunction within a family, drugs whether it be alcohol, or smack ; inhaled or injected. Drugs, that offer a temporary respite from the pain of living until they stop being a respite and become an urgent, potent, driving, and often deadly need. The insights are devastatingly written, and as such all too real. You have nowhere to hide from this story, except within the story itself. The author forces your hand, such is her talent that no matter the discomfort you are compelled … indeed driven to read on, like any drug this work captures you and leads you unresisting to an ending that could not have been handled any other way. Keep your eyes open for other works by Kate Rigby. Remember the name…this brand of talent will not go unnoticed. Labels: Book Review: 5 star review: Fiction; Dysfunctional Families, Must read. Great review Soooz. It completely clarifies the storyline for those wishing to read. Wonderful review. Not my usual reading preference, but by reading posts such as this one, I find note-worthy reads in other genres.